It wasn’t enough that my 3yr old HP Pavillion Laptop stopped working the other day. I never liked it anyway so maybe it picked up a vibe there. Having put deposits down at both Evans and the Cycle Surgery for Julia’s test rides, I’m now skimming through websites and catalogues to pick something a bit different from my current Hybrid Bike, featuring 2.5″ Big Apple Tyres and enclosed gearbox. It’s only 8 months old so I have no doubt Len from Finsbury Cycles will fix it (at some point – certainly not in time for this weekend though). I was on my way back home on Camden Road on Tuesday. Nothing unusual happened while I was riding (no potholes, no harsh driving or switching gears, no external shocks of any kind), but out of a sudden my twister-shifter spit out the end of the cable and the wheels blocked. The only usable gear was something low like 2nd, even though it was showing 4th. 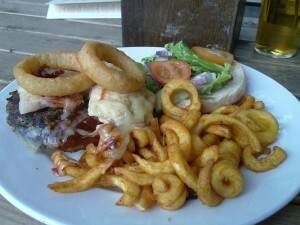 Final Supper before "The Incident": Burger and Chips at The Earl of Camden. Maybe that "Meat Stack" was too high? I continued my journey to the nearest Cycle Surgery in Highbury, filled with 4 blokes who didn’t look like working that day. “Yeah erm… it’s like hard to say what’s wrong with it – maybe we need to book you in for this” – And what’s keeping you, Dude? “Could squeeze you in next TUESDAY“ – that’s like 7 days to get an answer as to what’s actually wrong with my bike. Cycle Surgery Highbury = Waste of Time. It does depend on who you speak to though; we were in that shop a few days before and a few days after and people were very helpful on the other shift. A new gearbox is needed which IS NOT covered under the manufacturer’s warranty. Bo!!ocks! Apparently I won’t be able to prove that this was in fact a manufacturing defect and not “overusage”. Plus, Saracen have been taken over by a Shimano subsidary so they don’t want to know about a Sturmey Archer hub anymore. I’m happy to say though that Len agreed to do the fixing for free and only charge me for parts. That’s nice! When exactly this new gearbox is going to turn up or how much it’ll be is yet unclear – but realistically it could be several weeks. And I’ve only upgraded to super ergonomic handle bars on Monday! 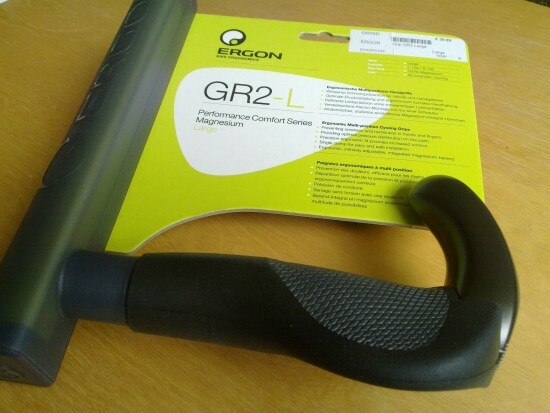 ... to these super ergonomic ERGON grips for £40. 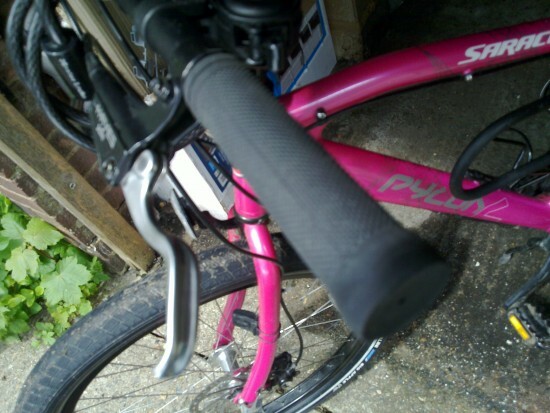 They're absolutely amazing and give you a much better grip on the bike, even though they make the handle bar slightly wider. Inspired by Julia looking for a new bike that doesn’t give her back ache and strains every time she’s using it, I’m haging round bike shops quite a lot lately. 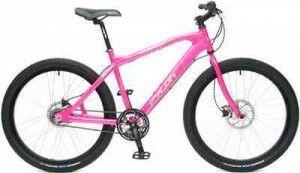 Her current (10 yr old heavy steel frame) never was the right size. New bikes are swish and shiny and exciting, even though I don’t know what model to pick. Oliver's new Sport Bike - he loves it! My friend Oliver just bought a second bike, distinctly different from his “City Bike” with enclosed hub. He chose a Flat Bar Commute Bike for some exercise on flat roads, not for getting coffee in town. He says it’s very nice to have an alternative to a thick wheeled city cruiser. But what shall I get for myself? Will it be a road bike with proper racing bar? Nah, probably more like a flat bar machine. But that doesn’t come with disc brakes or carbon frame. And it should be light. And I don’t want do spend an arm and a leg. There’s just too much choice on websites and in catalogues. Test riding is the way to go, which is how Julia arrived at her preference of the Globe Vienna bike. 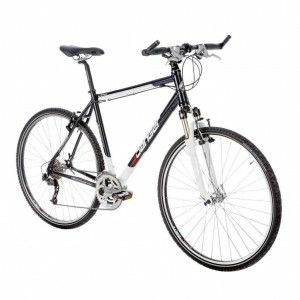 I quite like the look of the Trek 7.5 in bronze or black, but then there are hundres of others that are nice too. Even though it’s annoying to make a big purchase when you don’t want to, I think it’s very exciting to think that I don’t need to sit and wait for my other bike to be repaired. I’m in charge of my own destiny, and I can bloody well choose how often I’m cycling – and if that means a second “backup-bike” then so be it. I’m sure it’ll come in handy in the future.